This is a new Taiji quan (fist) form of only 20 years old. It is made for grading of second duan. It is easy to learn, no difficult movement, and evenly exercise every part your body. This 3 minutes routine is for the beginners. It will take about 8 weeks to finish. It is a Taiji quan form created in 1957. It is a simplified form from the very old ones. It is a very popular routine and you can easily find books or DVDs for it. Compare to 16, it has some difficult movements. This 4 minutes routine is used for grading of third duan. This is a relatively new form, created in 1980’s for the increasing demand of high level competition. 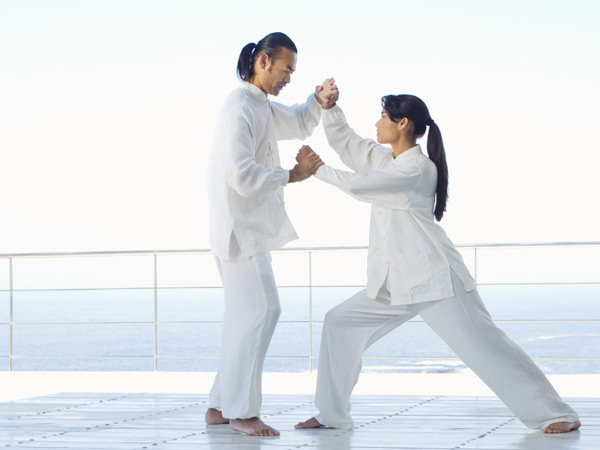 It has 40 forms covering most of the good movements of Yang style taichi quan. Obviously, it contains difficult movements. This is a good exercise for your body. Taiji sword is a combination of sword and taiji quan. This routine is based on Yang style taiji sword. It is also a simplified form. It is used for grading of fourth duan. The movements are slow and flow, simple and open. Sword play sounds aggressive, in fact, it looks more graceful than any other quan (fist) routines. It looks more like a dancing than a fighting. This is a routine made for competition. It is new and a bit long. It is good because it contains 5 different styles of taiji. They are Yang, Chen, Sun, Wu and Xing Yi. It gives you a fresh feeling. All of the competition routines are difficult to learn if done properly. It is also a routine for grading of high duan levels. Fan is a tool for giving some moving air to cool down body temperature. It has been using as a weapon in the past. There are some traditional Fan routines. These Taichi Fan and Gongfu Fan are composed by eight duan master LiDeYin. In 2002, when Beijing is competing the 2008 Olympic, 2008 retired people performed Taichi Fan at Tian An Men Square. Taichi/Gongfu Fan contains a big variety of movements. The slow part is taichi and the fast part is gongfu – mainly long fist. It reflects sword, stick, saber and includes taiji(yang, chen, sun, wu), bagua and long fist. They are long and difficult. The Taichi Fan is slower, and the Gongfu Fan is faster. It gives you a good exercise. Once you get it you enjoy it. Dao means knife, one side blade sword or saber. It’s a common use weapon in the history. If we say sword play is graceful, Dao will be graceful plus some valorous. Wu style is slightly different from Yang style. It turns more. This Dao routine is a traditional one and recently gets popular. It is not difficult to learn, but it’s difficult to perform it typically Wu style. This traditional routine is a mixture of taichi sword and wudang sword. It’s composed by late Master Litianji long time ago. It is faster but very graceful. It is long and also difficult do learn.